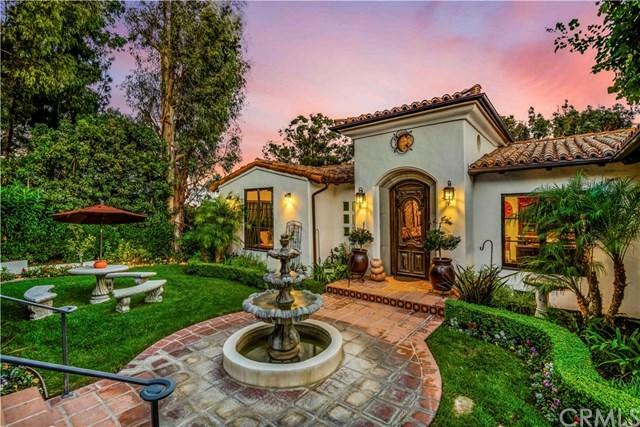 Absolutely Stunning Custom Spanish Estate Home in ValmonteThis is a one of a kind property that has over 3900 sq ft(taped) inside and over sized (13,384 sq ft) lot with City lights views! The home was custom designed by Architect Miles Pritzkat to replicate a 1920's Spanish revival home.Enter the property thru a private courtyard with fountain and over 200 year old front door.The main entry has custom hand painted tile floor, all hand painted tile was influenced by historic Adamson House in Malibu. 4 bedrooms plus an office and 4 baths. Entry floor has game room with f/p, 2 bedrooms and a bath.Also a Utility kitchen and laundry area leads to the two car garage w/ tons of storage. Upstairs is elegant master suite w/ City light and backyard views. There is also the fourth bedroom and separate bath.Downstairs is a large living room w/ f/p, guest powder room, Large wood french doors open to outside side courtyard w/ barbecue and outside fireplace. The wet bar room has windows that open to service courtyard festivities. The kitchen with fireplace, large wood doors that open to a sweeping staircase to the backyard. The kitchen has all the amenities, Wolf range, convection oven and warming drawer, 2 dishwashers, utility sink, bakers island, breakfast bar w/ room for dining in front of the f/p Descend one of two sets of outside stair cases to reach the lushly landscaped backyard w/ pool, spa and several seating areas including a fire pit. Entertainment oasis! A must see!